Here is how, it works Any individual across the world can be identified by his\her biometric details iris, fingerprint. While enrolling for aadhaar card, UIDAI takes every individual biometric detail which is stored in UIDAI database. And when an individual is to be verified or identified for the specific purpose, his\her aadhaar number(biometric details) would do that job. But aadhaar identity numbers, having been misused a lot nowadays, it is a good idea that every individual lock(biometric locking) their own aadhaar identity so that no one would misuse his\her identity. What is the Aadhar Bio-metric? Aadhar card Biometric means at the time enrollment we have given Iris and Fingerprint scan for aadhar card new registration. How to Lock or Unlock Aadhar Card Bio-metric Details Online and Why? Why we need to lock and unlock Aadhar Bio-Metrics? We know that there have occurred many incidents in which aadhar identity of an individual has been misused by others for different purposes. So as to avoid such things from happening UIDAI has provided us with the facility of locking our aadhaar identity biometrics. Lock your details for security purpose means to escape from unknown theft accessing your data. 1. 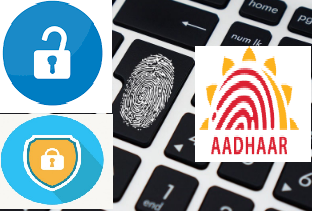 Visit the website https://resident.uidai.net.in/biometric-lock. 2.Enter the aadhaar card number and security code as required. 3. Click on generate OTP(which sends OTP to the registered mobile number). 4. Enter the OTP that you received and click on enable which enables the bio-metric locking. After enable you can also not possible to access anywhere your biometric details Iris and Fingerprint. If you want to access your aadhar biometrics anywhere for any urgency.. for that you need to disable enabled lock, disable means full permissions for your access. or unlock 20 min for aadhar card biometric, after unlock up to 20min you can able to access your aadhaar biometrics online, after that it automatically goes to enable mode. Example: Now many places aadhar using for identity and address, for New Simcard activation they are taking only aadhar card biometrics only...for that purpose you need to secure your aadhar details.